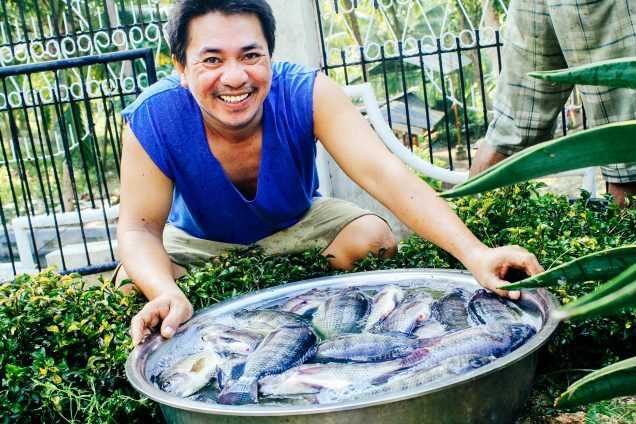 Photo: Profits from another abundant harvest at our fishery project will aid our orphan care and education programs in the Philippines. We are happy to report that earlier this month over 900 mature, healthy fish were harvested at our Philippines fishery weighing in at about 660 pounds (300 kgs). This is our third harvest since we began the project last year. We are now on pace to yield a harvest every four months. We sold all of the fish in the market and received a profit of $717, which although it may not seem like much to Western readers, it represents about 3 months wages in the Philippines. This profit is a great blessing as it will enable us to further supplement our children’s outreach budget, including school supplies and uniforms to ensure children stay enrolled in school. The supply of protein-rich fresh fish also vastly supplements the nutrition of our students and children in our outreach programs. We were able to harvest healthy fish thanks to our water storage tank and aeration system, which continue to work efficiently at our fishery on the island of Cebu. The water storage tank has increased our water flow which supplies the fishery, and it also provides clean baths for the children, aiding their hygiene and health. Water for the fishery is continually aerated and supplied with fresh water from a pure aquifer using our own well, reducing the chances of fish contamination to almost nil. We currently have 8,000-10,000 fish in our larger pond, thus we need to raise money to add 7 more aerator units to the water purification system to properly oxygenate our pond in order to keep this large number of fish healthy for the next harvest. Photo inset: (Top-left): Our native team is overjoyed with their recent harvest of fish from our main campus fishery. 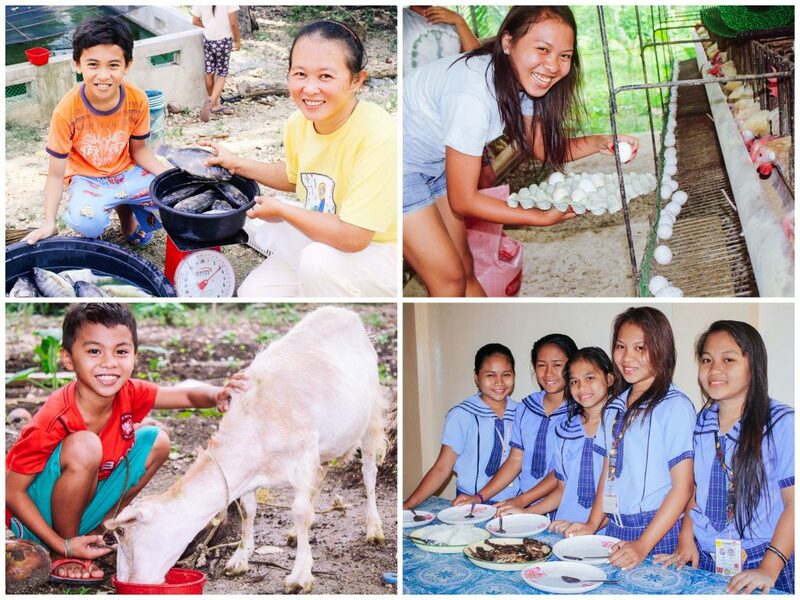 (Top-right): One of the girls in our orphan care program is delighted to collect fresh eggs from our on-campus hen house. (Bottom-left): Our native team is excited to have new goats to add to their farmland enterprise efforts. (Bottom-right): Girls in our orphan care program are thankful for a nutritious meal of fresh fish from our main campus fishery. Fishery profits also help provide for their school costs. Thanks to your donations and contributions from our generous donors, we have raised enough money to install a complete solar power system at our orphan home and farmland this weekend, which will give our girls a consistent source of electricity and light as they study and use the computers for school research. Solar power will also stabilize our electricity source for the water well pump and aeration system at our fishery. Installing solar power on campus will also reduce our monthly electric bill from $200 a month to what should usually be zero. We are very thankful for God’s provision given to our native team through your generosity. In pursuit of our sustainability goals, we’ve equipped our team with a hen house containing 148 hens which are currently producing around 124 eggs per day, a banana grove consisting of 60 trees that yield over 6,000 bananas a year, and a garden where we are currently growing eggplant, tomatoes, spinach, horseradish, scallions, ginger, lemongrass, and basil. Our entire farmland enterprise is working well along with our two fishery ponds. The main concrete-lined pond holds a volume of approximately 20,000 gallons (75,000 liters) of fresh water pumped from our on-campus well. All of these efforts not only aid in providing nutritious ingredients for our children’s meals, the also help diversify and increase profits, empowering our local team to reach even more children.